Bennie Swain, shown as a rookie for the Celtics in 1958, helped Boston win a championship during his only NBA season. A knee injury the following summer curtailed his playing career. He only had one season in the NBA, but he made it count. 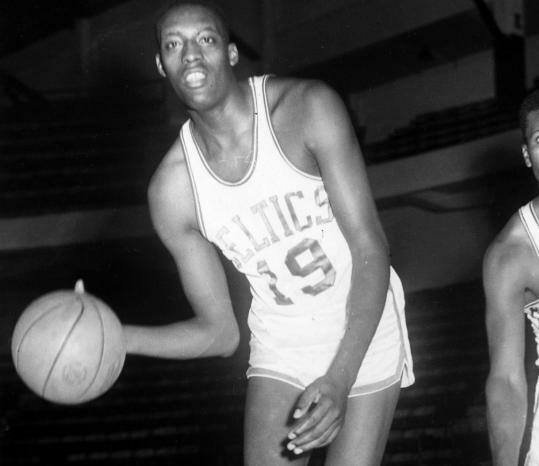 The seventh overall draft pick in 1958, Bennie Swain pulled down rebounds as the great Bill Russell's backup, helping the Celtics win their second national title in the 1958-59 season. In the summer after his rookie year, Mr. Swain suffered a devastating knee injury and would never play in the pros again. He moved on without regrets, returning to school and forging a new career teaching science and coaching high school basketball for almost 30 years, his family said. He died of cancer Thursday in Houston. He was 78. Mr. Swain was scooped up early in the draft by the Celtics after he led the nation in scoring as an All-American at Texas Southern in the 1957-58 season. After his injury, he played in semipro leagues before settling in Houston, where he lived and worked for the rest of his life. "Everybody who knew Swain loved him. He loved to teach students and he liked to steer them in the right direction," said Jerry Gather of Houston, a close friend and former teaching colleague of Swain's at Lincoln High School. "He knew they were there to learn, and he wanted to get the best out of them." Friends and family said Mr. Swain was also a loving family man. "His children, his grandchildren, and his great-grandchildren - he loved having them over. We always had family gatherings," said Tommie Swain, his wife of over 55 years. "Oh, he loved having all of them around." "We went on a lot of picnics and family outings, and we'd go on vacation. We'd travel a lot because we had family all around," said Mrs. Swain, who met her husband in high school when they were growing up in Talladega, Ala. "We had a lot of family dinners. On holidays, we all had big family dinners at our house." Mr. Swain loved to cook traditional Southern meals. In a January 1958 Globe report profiling the family lives of Celtics players, Mrs. Swain admitted her husband was the best cook in the family as he prepared broiled chicken, fried potatoes, and baked beans. Mr. Swain was known as a strong, physical player. "He was a forerunner of a [Kendrick] Perkins type of player," said NBA Hall of Famer Tom Heinsohn, who played with Mr. Swain. "He was a big, strong rebounding type of guy, an inside player, and you're always looking for rebounders, so he was going to get a really good look." He was being groomed to be one of the NBA's great rebounders under legendary Celtics coach Arnold "Red" Auerbach. "Red would break players in. They'd play a little bit and then they would carve out a niche for themselves. Swain could have been a really good player, I think," Heinsohn said. In his only pro season, despite averaging just 12 minutes behind Russell, he still averaged 4.5 rebounds and 4.5 points. He played in 58 regular season and five playoff games. His wife said that, 49 years later, an ailing Mr. Swain was able to watch his Celtics win the NBA Finals last week from his hospital bed. "The Boston Celtics family is saddened to hear of the passing of Ben Swain," said Jeff Twiss, spokesman for the Celtics. "He helped us win our second [championship] in our great history, and it's bittersweet that he passed away on Thursday while we were celebrating our 17th title. . . . He will always be a world champion." After his injury, Mr. Swain was put on waivers and eventually released by the Celtics. His family said he didn't look back. "Bennie wasn't the type of person to stay back with regrets. No, he'd just move on. He didn't worry about the past," Mrs. Swain said. "He just moved on with whatever comes next in his life. That's what he did." In addition to his wife, Swain leaves two sons, Bennie Jr. and Richie, both of Houston; and two daughters, Marva Oreaboe and Cynthia Gholson, also of Houston; 11 grandchildren; and four great-grandchildren. Services will be held at 11 a.m. Wednesday at Outreach Missionary Baptist Church in Houston. Globe Correspondent Marc Robins contributed to this report. John Guilfoil can be reached at jguilfoil@globe.com.